If your collection of cigar-smoking accessories were a chess set, the tabletop lighter would no doubt be a king. More stately in both size and appearance, it is designed not for mobility, but a more sedentary existence. At once functional and ornamental, tabletops have traditionally been displayed atop their namesake pieces of furniture or on a desk. Nowadays, however, tabletops are seen at poker tables, resting on home bars or even making the occasional excursion to the patio. One fundamental change in recent years made this all possible. In days of yore, devices that produced a soft flame dominated the category. 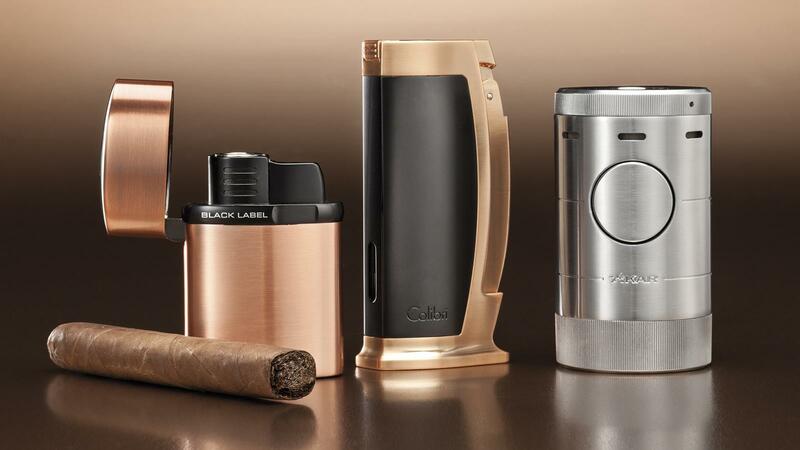 But, as cigars have grown in girth, manufacturers have responded by producing tabletop lighters with powerful adjustable jet flames, followed by fuel windows, larger-than-normal fuel chambers and other features. For those wanting to combine the sophisticated elegance of old-world design with modern technology, Colibri's Enterprise T1 (center, $150) bridges the gap nicely. Standing a little more than 4 1/2 inches tall and coming in three colors, the Enterprise T1 is an enlarged version of the company's popular Enterprise 1 pocket lighter. Integrated 7 mm and 9 mm punch cutters slide out from the top. With a gentle squeeze of the T1's large, single-action ignition system, a solitary jet flame bursts from the lighter. An oversized knob on the base of the T1 adjusts the flame. Xikar's new Volta tabletop (right, $150), which comes in four colors (including a Room101-scheme designed by brand owner Matt Booth), boasts a simplistic modern, cylindrical design that any aficionado can appreciate. The Volta's four jet flames are protected by an aperture-like lid that is opened with a simple twist, and the flames are operated by an oversized button on the body of the lighter. Additionally, the flames are adjusted via a ratcheted, oversized wheel that doubles as the base of the lighter. For the true modernist, Integral Style has created the new Black Label Tornado (left, $60), which is available in four finishes. The all-metal Tornado's key feature is its cone-shaped flame. A screen located atop the jet acts as a baffler of sorts to create a cone-shaped flame that makes it easier for users to toast their cigars. The company also claims this type of flame uses less butane fuel than other multi-jet-flame lighters. While traditionalists may eschew these new breed of tabletop lighters in favor of a soft flame or match, we say its never been a better time to buy into the new technology. Your cigars will thank you. Visit colibri.com, integral-style.com and xikar.com.